October 19: In a systematic assessment of individual parliamentary performance of Honourable Members of 14th National Assembly of Pakistan by PILDAT, Ms. Naeema Kishwer of JUI-F attains first position and thus MNA OF THE YEAR through the highest score of 70%. Based on performance indicators of individual MNAs during third parliamentary year (June 2015-May 2016), overall average performance score of MNAs stands at 38% compared to average performance score of Senators at 41% in a similar Score Card on Senators’ Performance by PILDAT. MNAs who have scored the lowest rank of 39th position with an overall score of 20% include notables such as PTI Chairman Mr. Imran Khan; Mr. Hamza Shahbaz Sharif of PML-N and Ms. Faryal Talpur, Head of PPP Women Wing. Senior Deputy Convenor MQM Dr. Farooq Sattar attained an overall score of 22% and 38th position (second last rank). 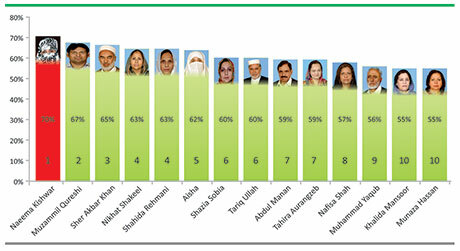 Similarly, former Speaker National Assembly Dr. Fehmida Mirza of PPPP also attained an overall score of 22%. Former Prime Minister of Pakistan Mr. Zafarullah Khan Jamali attained an overall score of 27%, which is the 35th position. PML Punjab President and former Chief Minister Punjab Ch. 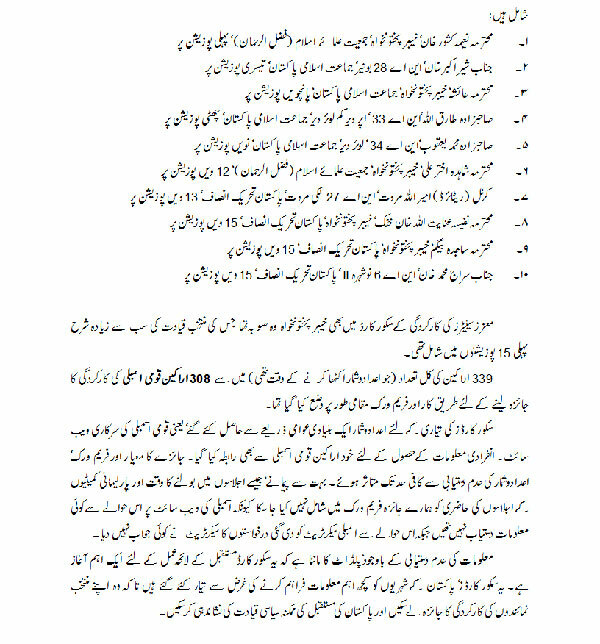 Pervaiz Ellahi also attained an overall score of 27% while JUI-F President and Parliamentary Leader Maulana Fazal Ur Rehman attained an overall score of 35% which is the 30th position. President PMAP Mr. Mehmood Khan Achakzai attained an overall score of 36% with 29th position which is also shared by PTI Vice-Chairman Shah Mahmood Qureshi. AML President Sheikh Rashid Ahmed attained an overall score of 39% and 26th position alongside Mr. Shafqat Mehmood of PTI. Dr. Arif Alvi of PTI attained an overall score of 43%, which is the 22nd position while Ms. Shazia Marri of PPPP received overall score of 46% with 19th position. Mr. Asad Umar of PTI attained an overall score of 47% which is the 18th position. PPPP Parliamentary Leader Syed Naveed Qamar attained an overall score of 51% with the 14th position. 308 MNAs have attained ranks or positions between 1 and 39. 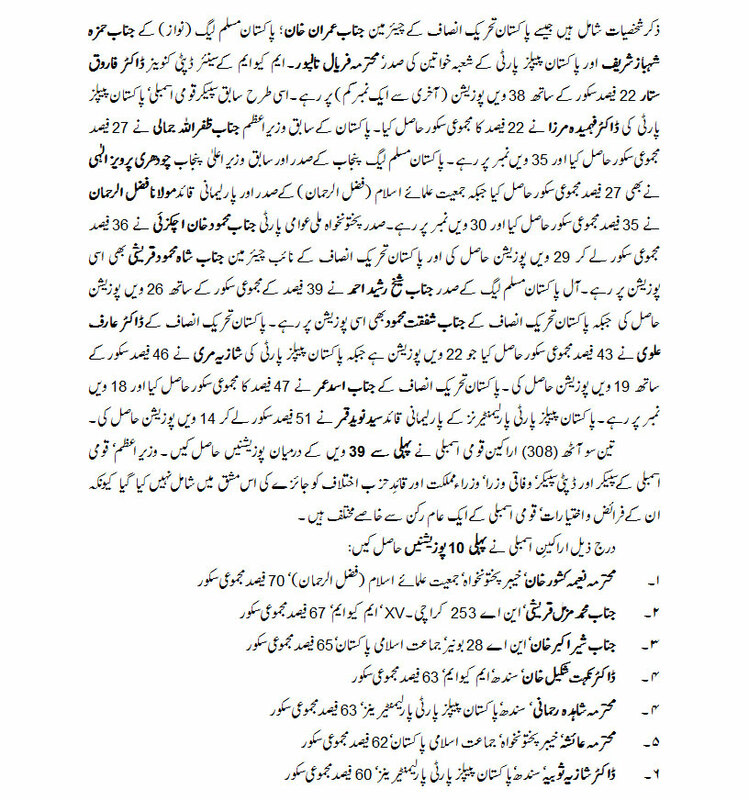 Prime Minister of Pakistan, Speaker and Deputy Speaker of the National Assembly, Federal Ministers, Ministers of State and Leader of the Opposition have not been included in the assessment exercise as their powers and functions differ greatly from that of a regular Member of the National Assembly. It is interesting to note that 9 out of 14 MNAs occupying the Top 10 Ranks are Women and all of them belong to the category of Reserved Seats for Women in the National Assembly. The performance scorecards by PILDAT focused on three main aspects of the parliamentary role of an MNA: Oversight, Legislation and Representation. 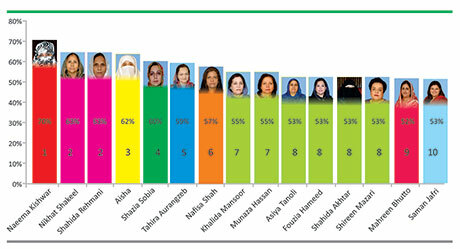 All top performers of the three categories are Women parliamentarians. The Top Performer in Oversight is Ms. Naeema Kishwer Khan, KP, JUI-F, with an average score of 3.4 out of 5. Although she chaired no committee, she is a member of four (4) committees; she presented 2 Resolutions, 11 Calling Attention Notices and 134 Questions in the House during the year. The Top Performer in Legislation is Dr. Nikhat Shakeel Khan, Sindh, MQM, with a total of 8 Private Member’s Bills introduced in the National Assembly during the year. The Top Performers in Representation are Ms. Naseema Hafeez Panezai, Balochistan, PMAP and Ms. Aliya Kamran, Balochistan, JUI-F, with the highest attendance of 100% in the plenary sessions of the National Assembly. In the case of a similar assessment of Senators carried out by PILDAT in June 2016, PPPP was the leading political party with the highest number of its elected leadership among the top 15 positions. 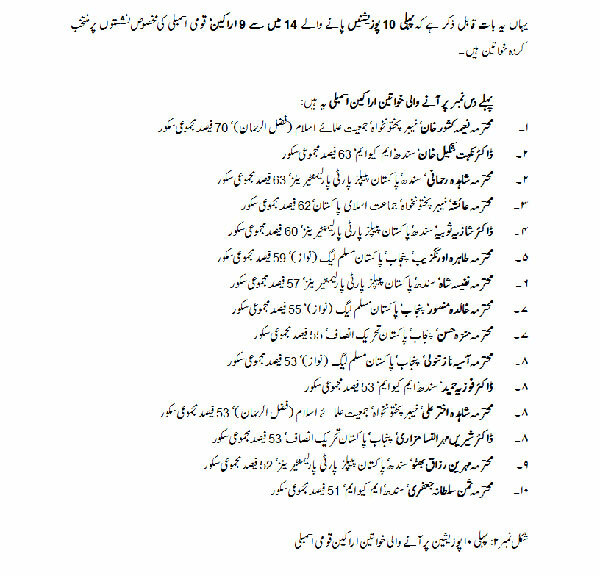 In the case of Scorecards on Honourable Senators’ Performance Report, again KP was the leading province with the highest percentage of its elected leadership among the top 15 positions. The methodology and framework of assessing the performance of 308 MNAs out of a total strength of 339 (at the time of data collection) was developed indigenously by PILDAT. The data for preparing the Score Cards was obtained from one main public source: The official website of the National Assembly of Pakistan. MNAs themselves were also contacted to provide individual data. The assessment criteria and framework were seriously constrained by the availability of data. Many parameters such as the Talk Time in the plenary sittings and attendance in the parliamentary committee meetings could not be included in our assessment framework as no data was available on the Assembly website while the National Assembly secretariat remained non-responsive to all specific requests made for obtaining data. Despite the limitations in data, PILDAT believes that this score card constitutes a reasonable beginning to build on in the future. These Score Cards seek to provide the citizens of Pakistan with some critical information in order to empower them to monitor their elected representatives and to identify the prospective future political leadership of Pakistan. The objective behind PILDAT’s evaluation exercise is to promote transparency and democratic accountability of the elected representatives by citizens and to help in mapping exercise of the future political leadership of Pakistan. This is a first attempt made by PILDAT to assess and rank the performance of MNAs, and hence, may have a lot of room for improvement. PILDAT will welcome comments and suggestions for improvement in the concept, methodology and framework of assessment and presentation of the MNAs’ Score Cards.